This is a tree skirt which is made from simple half square triangles and squares and can be a variety of sizes. The red one is 38" wide and long, and is made from 4" finished half square triangles. It is 32" before borders. The gold one is 28" wide and long and is made from 3" finished half square triangles. It is 24" without borders. I will give instructions for the smaller gold skirt with variations for the red one in parentheses. But you could easily change the border dimensions or the triangle sizes to vary this to many sizes. There are dozens of ways to make half-square triangles. I cut squares 1" larger than my finished half-square triangle size, marked them on the diagonal from corner to corner, stitched 1/4" on either side of the marked line, cut them apart and pressed them open, and then trimmed them to my finished size. This technique works well for the scrappy look I used in both tree skirts. Feel free to use any method you really like, but you will need to figure out how many pieces and sizes to cut for other methods. Following my instructions you will need 1/3 yard of the light background fabric (5/8 yard of light background for the larger one). I used one background fabric, but you could also make the light fabric scrappy. For the gold I cut 2-3 of the squares out of 13 different gold fabrics. You would do the same for the red. You could use more or less red or gold fabrics. 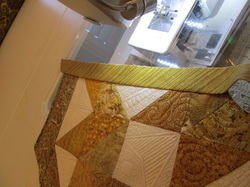 For the border I used a gold border stripe and cut approximately 108" of the lengthwise stripe. If cutting crosswise strips, you would need 3 strips of 2-1/2" wide. (For the red, larger version, you would need 4 strips cut at 3-1/2" wide. For the binding, see binding instructions, below. You will need to cut 12 squares that are 3 -1/2" square (4-1/2" square). You also need 16 squares that are 4" (5") square for the light half square triangles. You will need 32 - 4" squares of gold (5" squares of red) for the dark half square triangles. Match each of the larger background squares (light) with a gold (red) square and mark a diagonal line from corner to corner across one of each pair of the squares. Match the rest of the gold (red) squares with another gold (red) square and mark diagonal lines on these pairs, also. Sew 1/4" on either side of the drawn line. I'm using a quarter- inch foot that is an accurate 1/4" on either side of the foot, but you can also mark the 1/4" lines and sew on the those lines, as well. Repeat for every pair - both gold/gold (red/red) pairs, and dark/light pairs. Cut each pair apart along the drawn line. Press each pair open. You can press the seams to one side or open. Now you will need to trim each of the half square triangles to 3-1/2" (4-1/2"). I like to use a ruler with a diagonal line that I can line up on the seam to make sure the seam line stays in the corners. When all are done you should have 32 gold/light 3-1/2" half square triangles (32 red/light 4-1/2" half square triangles), and 16 gold/gold 3-1/2" half-square triangles (16 red/red 4-1/2" half square triangles). You also still have the 12 light 3-1/2" (4-1/2") squares. Arrange the half-square triangles and squares into this arrangement. I like to chain piece the rows together, adding one piece to each row with a thread chain in between the rows. I pressed all seams between blocks open. I do this because it makes for a smoother top to machine quilt. But if you prefer to press them to one side, press one row up and the next down. Here are the rows all sewn together and connected by the thread bridges between rows. Now just sew the rows together and I pressed the seams open. Here is the top completely sewn. Now to trim the uneven sides. Place a ruler along the edge with the 1/4" line on the ruler just to the outside of the pieced points. Now trim off the extra triangles of background fabric. This does leave you with a bias edge, so treat it gently - don't pull or stretch the edge. If it will be awhile before you get to the quilting, you might want to run a line of straight stitching at about 1/8" from the bias edges. Here is the trimmed center top - ready to add borders. The first strip you sew on will be the shortest. I simply cut off a length of my border just slightly longer than one of my short sides and sew it onto the bias edge. Don't stretch it at all as you sew and if you sew with the cut triangles touching the feed dogs, it will tend to ease in any excess fabric. Here I have turned over the seam so you can see that the seam goes just to the outside of the points. Measure for the next strip - it will be longer because the straight sides are longer and there is the addition of the border, also. Now trim off the excess ends of the border strip. 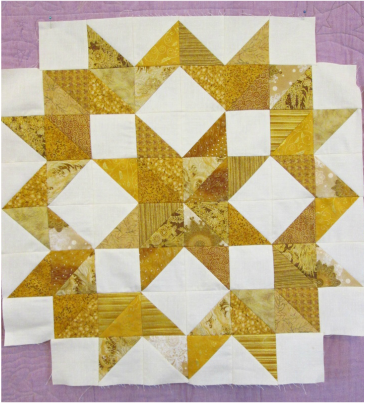 Lay a rotary ruler along the straight edge of the quilt top and trim off the extra triangle. Repeat for both ends of the border strip. Sew on the next border strip. Trim the end. Measure and cut the next border strip. Sew on. Repeat until your quilt looks like this. Ready to layer and quilt. Before I start to quilt, I like to mark where my center hole will be. Why quilt it and then cut it out? The size of hole you cut depends on your tree - artificial trees have a very small trunk and real trees a larger trunk. This skirt is for a 4 foot artificial tree and has a 3-3/4" hole. That is the inner circle The outer circle is where you sew on the binding. If you are doing a design that you don't want the binding to cover, that seam line is the line you are most interested in quilting up to but no farther. (The red skirt is for a slim 7 foot tree. I cut a 4" hole in this one.) The smaller the hole, the more difficult it is to bind, so I, personally, wouldn't make the hole smaller than 3-1/2". Now quilt it - simply ditching between the blocks and around the border would be more than adequate for a tree skirt which may never be washed. But, a tree skirt will be displayed year after year and I love to quilt - so I added a lot of quilting. I marked an arrow-like design in each of the background areas, filling each arrow with straight lines and then quilted the background with a straight-line stipple. Quilting will be the most visible in the plainer, light areas, so I added the most detail there. The gold prints are quilted with an all over swirl design. This gives you a contrast in texture. ​The border was quilted with more swirls. This one was quilted more simply, but still effectively, with radiating lines in the light areas and a flowing, free-form feather design in the red areas - including the border. theOnce you are finished with the quilting, I like to stitch approximately 1/8" on either side of whichever seam you plan to cut open. It will keep any cut quilting or stitching from raveling. I did mine with my free motion foot, but you can also stitch it a regular or walking foot. Now you can cut the opening and the center with with a rotary cutter or scissors. Next up is measuring for your binding. To measure along a curve, stand your tape measure on its side and measure along the seam line. Jot down the final number . Now starting along the opening measure down and then around the circumference of the skirt. I measure just half of the skirt - double the final number and add the number for the center circle and about 10-15" for corners and overlap. Bias binding is needed to bind the edge of the circle. It would be possible to cut one strip of bias for the circle and cut the rest on straight of grain. But I like bias binding, especially with a stripe- it gives a lovely effect. There is a continuous bias binding tutorial on this site, that you may want to look at. That is how I did this one. I used a piece of fabric approximately 20" x 20" for this quilt. (For the red quilt it was about 24" x 20".) You can cut any size rectangle as long as the total area is about the same or slightly larger. I figured it would take about 150" of binding for the gold skirt (Around 230" for the red.) if using a different method. I cut my binding at 2.25" for both. Once my binding is made, sewn into a long strip and pressed wrong sides together lengthwise, I start to sew it to the edge at one of the straight opening sides. It is easier to join ends along a straight edge plus the opening usually goes in the back. I leave a 10" end (approximately) and start sewing with a 1/4" seam, toward the center circle. The corner where you turn to sew around the circle is mitered just like any other 90 degree quilt corner. General binding instructions are available in another tutorial on this website also. Sewing the circular opening just takes matching the edges of the binding to the edge of the quilt and sewing just a few stitches. Then pivot the quilt and line up the next inch or so of the binding to the edge and sew. You don't want to pull the binding tight or ease extra binding into the seam. Just sew slowly pivoting as often as needed until you get to 1/4" from the next corner. Turn this corner like normal and continue to add the binding to the opening and outer edges of the quilt. When you get to the first octagonal corner as you go around the outside edge, this is how you miter the corner. Stop 1/4" from the new edge. Pull the skirt out from the machine and turn the binding out from the edge so that the edge of the binding forms a straight line with edge of the skirt that is about to be sewn. Then fold the binding back on itself. The fold will come right to the edge (as it usually does in a mitered binding) but only right at the edge of the quilt. This is the correct angle for turning the corner. Now stitch from the edge of the quilt, across the fold and on down the side. You will do this kind of corner 8 times. Then the final corner will be a standard 90 degree corner. Join the ends of your binding using the method you like the best. After completing sewing the binding to the front, I turn it and press it to the back of the quilt. That way I can crease in the proper angle for the octagonal corners. This shows the first side pressed. These 2 photos show folding in the miter on the back side. You will have a fairly shallow tuck. I know I have it right when the two edges of the binding meet at the corner. I stitched the back side by hand, but on a tree skirt you could stitch in the ditch from the front and catch the binding that way also. You could also stitch it to the back first and then turn the binding to the front and catch it with a stitch in the ditch. You may have noticed that on the red version, I didn't have quite enough of the red and white striped binding fabric to go all the way around. So I ended the binding with a partial strip of a solid red. It is on the back of the skirt and allowed me to have the fun, candy cane look for my binding everywhere that most people will see it. I hope you enjoy this tutorial and enjoy making this simple tree skirt for yourself!